Armenia’s President says the country’s membership in the Eurasian Economic Union has in no way impeded the cooperation with the European Union. “Armenia acceded to the Eurasian Economic Union with a clear understanding that doing so would best serve the development of our economy and the future of our nation. The results achieved since our accession do prove our trust in the path we embarked upon. Meanwhile, it has in no shape or way impeded our cooperation with the European Union, especially in the areas of institutional reforms and modernization,” he said. “Our cooperation with the European Union has been elevated to a new level by the recently concluded Comprehensive and Enhanced Partnership Agreement. It is now important for the ratification of this document to proceed at due speed,” the President added. “Modernization is a constant process, which makes us keep pace with the times. We shall always strive to cooperate with all those powers that boast great achievements and can contribute to the modernization of my country. The above policy facilitates Armenia’s cooperation with both the Eurasian Economic Union and the European Union. 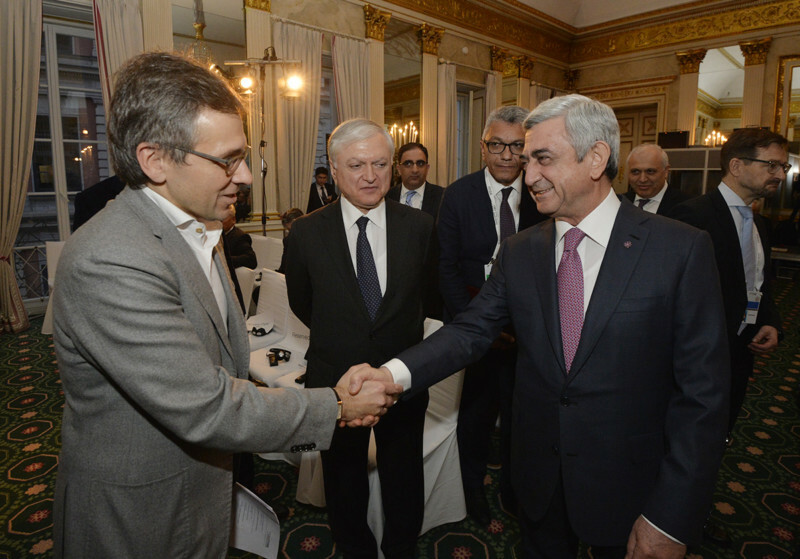 It also unleashes opportunities for everyone who is interested in the development of entrepreneurial ties with these two integration structures,” President Sargsyan noted. “We have been negotiating with all the interested countries with the objective of creating a new transit corridor between the Black Sea and the Persian Gulf. We hope that their successful conclusion will render a list of beneficiaries that will be far more extensive than the countries engaged in the negotiations process. In my view, collaboration of the member States of the EU and EAEU in both bilateral and multilateral settings is consistent with our shared interests and will contribute to our economic advancement,” the President said. 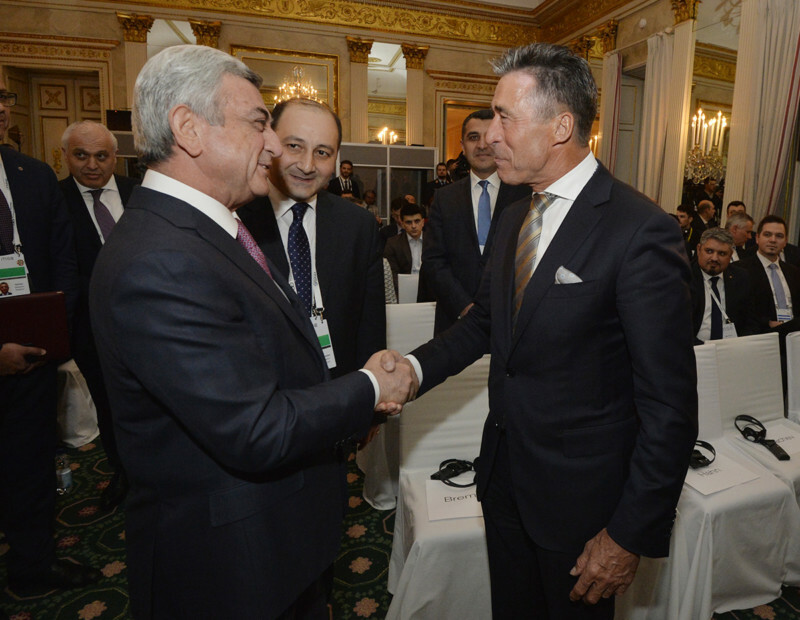 President Sargsyan attended the Munich Security Conference at the invitation of Munich Security Conference Chairman, Ambassador Wolfgang Ischinger. 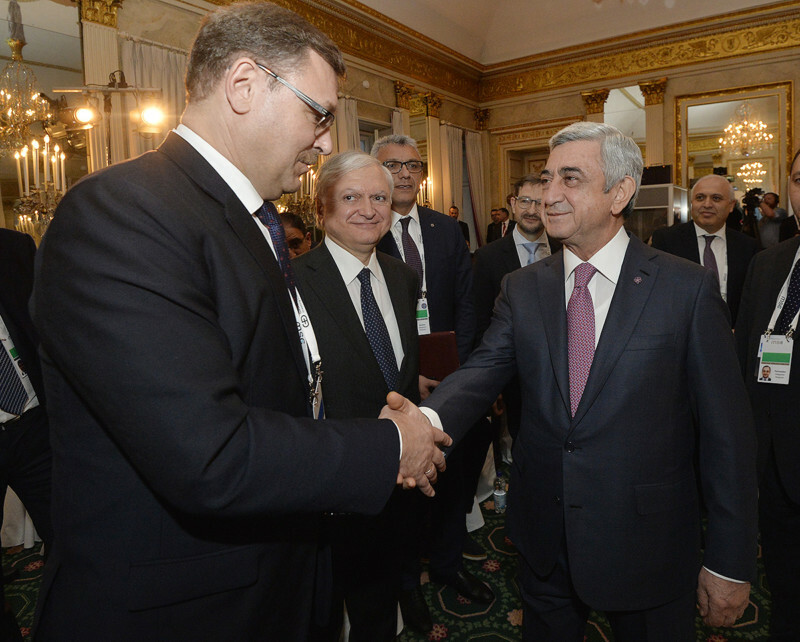 In his speech Serzh Sargsyan addressed Armenia’s foreign policy in the current geopolitical environment, the country’s effective cooperation with the EAEU and the EU in the framework of the ongoing integration processes and the security challenges faced in the region. In that context, the Head of State referred to the OSCE Minsk Group-brokered settlement of the Nagorno-Karabakh conflict and Azerbaijani authorities’ non-constructive stance, which hinders the talks. The President also spoke about the commitments assumed and negotiated within the framework of the Organization for Security and Cooperation in Europe, emphasizing that the Helsinki Accord, which started as early as in the 70s of the last century, sought to achieve security and cooperation in Europe, strengthen solidarity between peoples and ensure a dignified and legitimate cohesion, which still goes high on the European agenda. The President of Armenia stressed that the ten principles enshrined in the Helsinki Final Prospect are closely interrelated, and none of them should be separated or opposed to others.